"The power of Girl Rising is that the stories allow for a deeper understanding of the human condition, increased empathy, and illustrate the role women inhabit in many parts of the world is something that should concern us all." To use the powerful stories in the film to enhance my students' understanding of how gender can be used to disenfranchise young women. We also use it as a model for advocacy, how telling stories and sharing is in itself a form of protest. I have used Girl Rising for years in many different capacities. Currently, I use Girl Rising as an additional primary text in our unit on Agents of Positive Social Change while reading I am Malala. The students watch the film over a two day period and analyze the text while viewing. We then break into small groups to discuss the stories, share our reactions, and talk about how the social construction of gender is an issue that demands our attention. View the lesson plan for introducing the Girl Rising film to students. 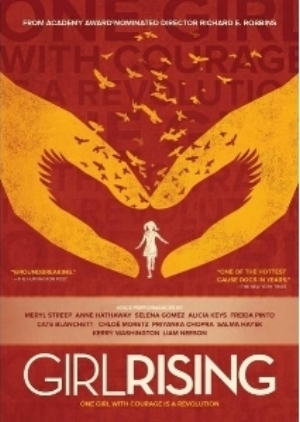 I use Girl Rising as an entry event into a project based unit that asks students to identify a social issue and create a way to be an agent of positive social change. We watch Girl Rising as an launch event to get them to think about the power of personal stories as a tool for positive social change/advocacy. View the Choosing to Participate in Activism project worksheet and a sample of the completed activity. Which chapters of the film did you screen? I do create my own materials, mostly discussion questions that the students generate while they watch. So they take notes while they watch them film, then generate their own questions from their notes. I guide the process and facilitate the conversation. Here is a viewing exercise Megan designed to help students process the stories in Girl Rising. Here is a processing worksheet for another piece of storytelling used in the unit, "What Islam really says about Women," a TED talk by Alaa Murabit. We screen it as an event with the whole 6th grade, however would like to expand that this year into a more public event with parents.